Use our nickel silver sheet stock to make water seals in ferrules, to cap off reel seat tubing when making caps, or with forming dies to create your own entirely unique components. Thickness is noted in sheet gauge and thousandths of an inch. Priced per 6” x12” sheet. Heavier gauges make sturdier water seals (20 & 18) and reel seat caps (16). Lighter gauges are more easily die formed. 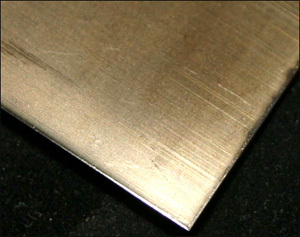 Our sheet stock is dead soft, 18% nickel silver alloy. Thank you for making us your custom rodmakers’ supply house since 1998. © 2019 Golden Witch Technologies, Inc. All Rights Reserved.